Advantages: English and Polish text; colour profiles; reference photographs; fold-out section; colour chart approximation included. Disadvantages: Nothing particularly new in illustrations. This is number three in a new series of softback books from Poland, numbers one & two being JG27 & JG26 respectively. 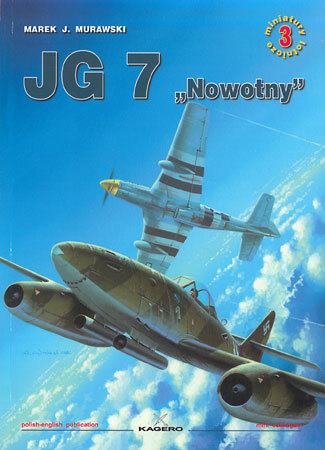 Written in both Polish & English, the book covers JG7’s operations with the Me262, so it’s timing is perfect to coincide with the new Tamiya kit. The book is sized 6.5 X 9.5 inches & runs to 78 pages on fine quality, glossy paper. 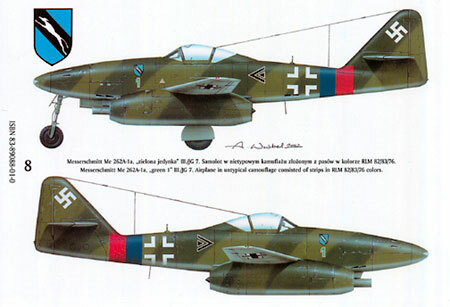 The story starts with a brief look at the Me262’s creation, before soon moving on to the creation of JG7. There then follows a chronology of the units operations & experiences, right through until the German surrender in May 1945. These events are interspersed with brief quotes from both Allied & German pilots, appropriate to the section being recounted. A novel idea is the dividing of each page into two columns. The left one is in Polish & the right in English. There are the odd errors in translation, but nothing serious, unless you are an English teacher! The illustrations show nothing really new, but offer a good selection of aircraft photographs & portraits to illustrate the story. Including the rear cover, there are six colour side profiles of Me262’s, together with a fold out section offering three more colour profiles. Also included is an advertising sheet for Kagero books, which includes a paint shade card! As admitted by the publishers, this is only an approximate guide, but it is well printed & offers FS numbers as well. Summing up, this is a very readable publication on the history of this unit. The addition of colour makes it of value to both the modeller & historian alike. Whether the other two books are trying to cover too much compared with this one I do not know, as I have not seen them. But this book has proved to be a worthwhile addition to my library.